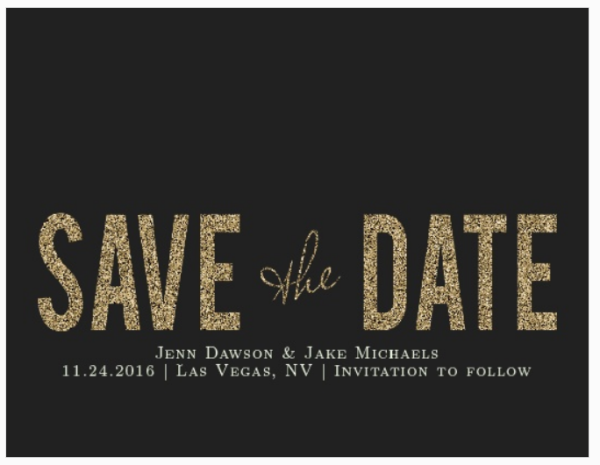 Get engaged over the holidays and can’t wait to get into Vegas wedding planning? 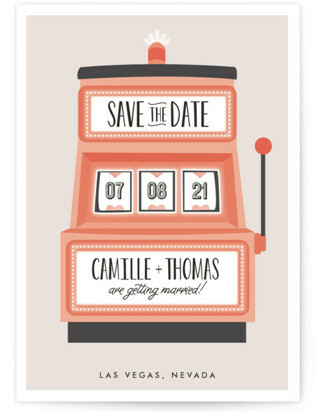 Save the dates are a fun way to help your guests get excited about travelling for your wedding. 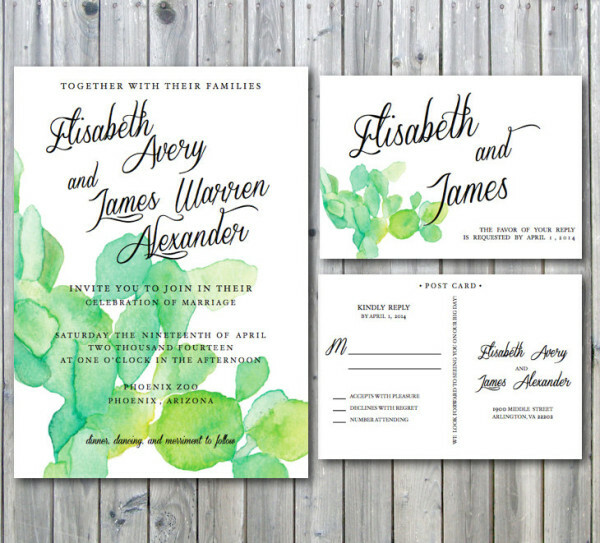 There are plenty of new designs for 2016, here are some of my favorite picks. 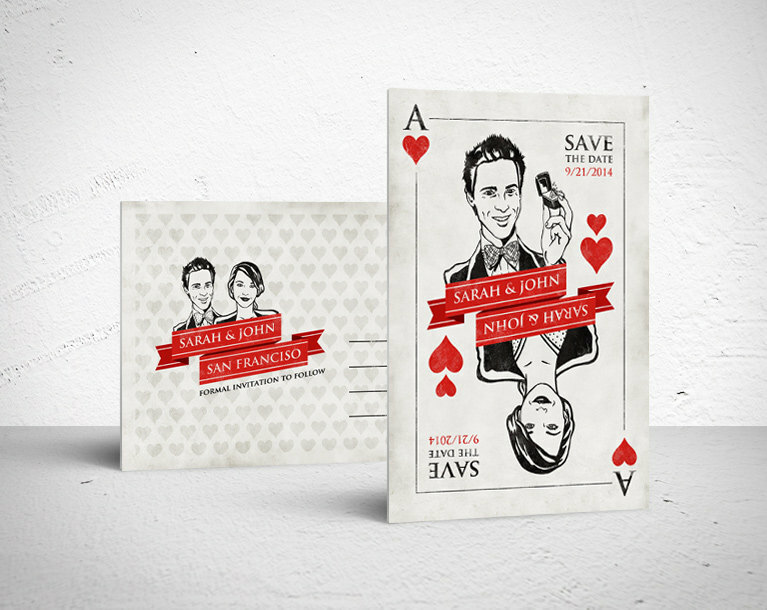 Many are available in different colors or with customizable photos, so be sure to have fun and design a few! The easy route is to go with a casino theme for your save the dates, of course. From retro signage to bold red and black coasters, here are some great options to consider. 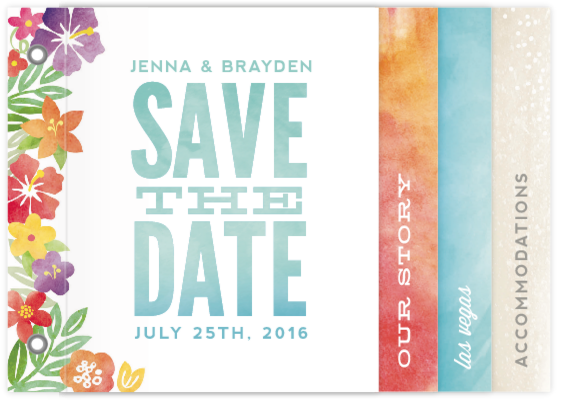 Destination wedding in Vegas? 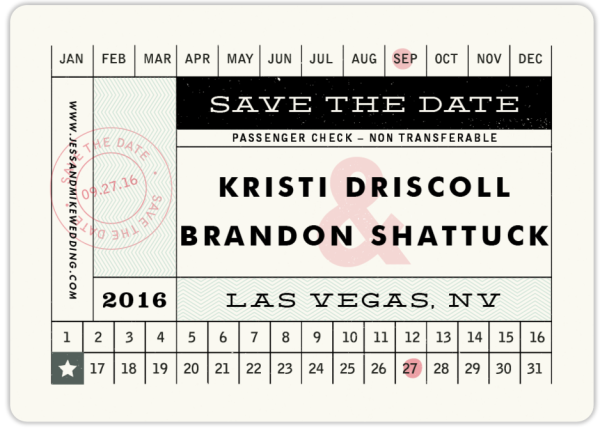 The ticket-style can be classy! 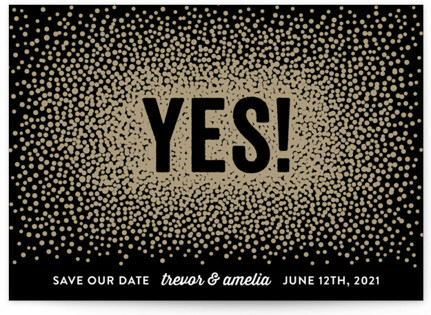 Champagne, sparkles and a little bit of glitz on your save the dates say Vegas in a subtle way. 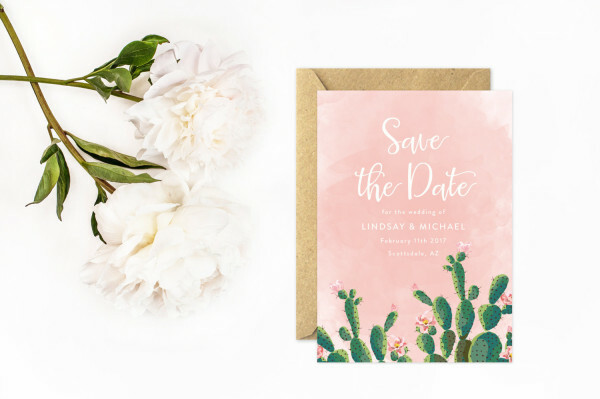 Cactus by Mooseberry Paper Co.
LVW Mailbag: BYOP — Bring Your Own Photographer? Oh man, what’s going on? Even the LVW Monday Mailbag is back! 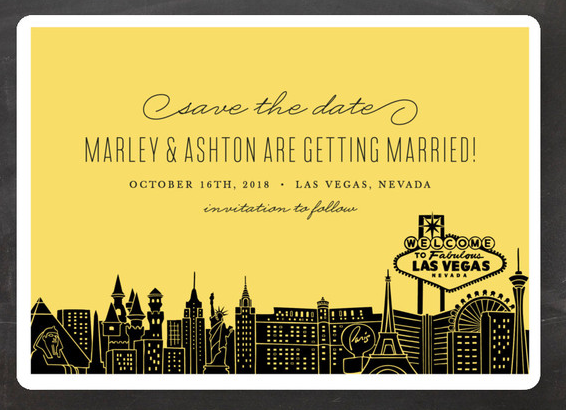 Since it’s been a while since the last instalment, a refresher: this is where you get to hear my thoughts and opinions on Vegas wedding planning questions. Today, I answer a question about intimate, stylish but budget-friendly elopement spots that are light on the cheese factor. I’ve been to your website many times and loved it. 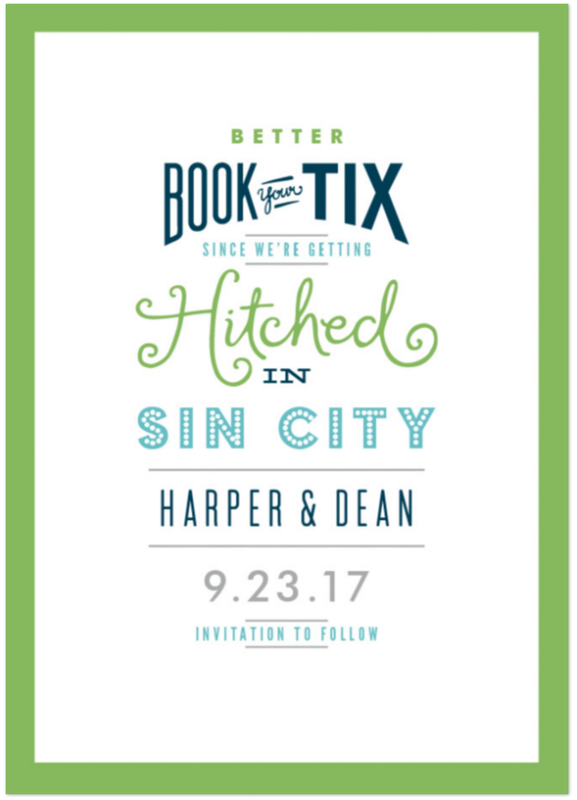 I’m getting married soon in Las Vegas, at a wedding hosting 14 guests. Do you know any chapels who would allow outside photography or charge a fee to allow personal camera? The wedding chapels of Las Vegas is the only one I found that will allow the use of personal camera. But I’m confused if the chapel will consider the photographer I hired will be considered his camera as personal camera. The most important part of this wedding for me other than the ceremony is the wedding pictures. But I don’t like the photos of many of the photographers chapels make you use. I appreciate suggestions and advice. Most venues consider photographers with pro camera equipment (even friends with large cameras) to be professional, so there is no sneaky way around that. Many hotel chapels and standalone chapels will require you to use their photographers, so I would recommend looking at Caesars Entertainment chapels: Paris Las Vegas, Caesars Palace, LINQ, Flamingo Las Vegas and so on. Almost all of them will let you pay a fee to bring your own photographers. Also Tropicana will let you bring your own photographer. Off Strip, many golf clubs and banquet venues will allow you to use your own photographer, as well. This is the most important thing to you, so I would start looking at those properties first. 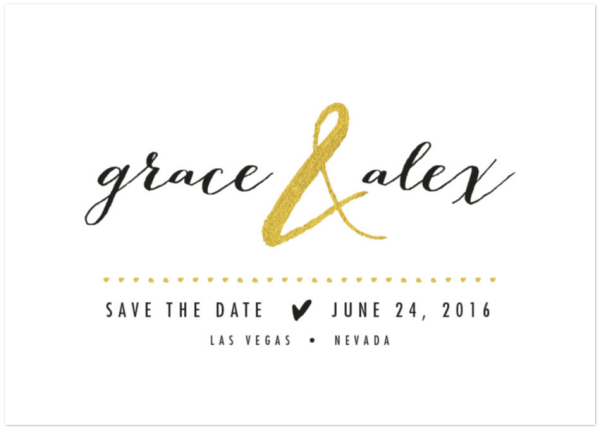 Have a Vegas wedding planning question? Feel free to send it to me at kelly AT littlevegaswedding DOT com with the subject line: “LVW Mailbag” or leave a comment on one of the posts. I may answer it in a future mailbag feature. Questions may be edited for length, clarity and privacy. If you want more immediate help, I encourage you to join the LVW Wedding Planning Facebook group. This private group is full of people planning their weddings just like you as well as some vendors. Both are great for knowledge and advice and are probably much more in the know than me! You can also read past mailbag questions here, a good place to start because I get a lot of similar questions. Today in the LVW Monday Mailbag, a couple wants to know where to find macarons easily and some suggestions for candy/dessert bars. We are getting married soon in Vegas and we’re hoping to have our reception in our suite. I was hoping you might have some tips on creating a candy/popcorn bar for the event? Also the bakery I might order the cake from doesn’t do macarons and my fiancé loves them so I was hoping to incorporate them in as well. Also a gift for our guests would be nice! There are a few places on Strip you can get macarons from: Bouchon Bakery at Venetian and Payard at Caesars Palace come to mind. Macarons are pretty popular these days and are fairly easy to find. Off-Strip bakeries would also almost certainly deliver. There are companies that will set up a popcorn or candy bar for you and honestly, if you are coming in from out of town, I would recommend it as they will take care of containers, signage and flavours. Try Popcorn Girl and B Sweet Candy, Sugar Jar or Hello Kandy. I love your blog/site! 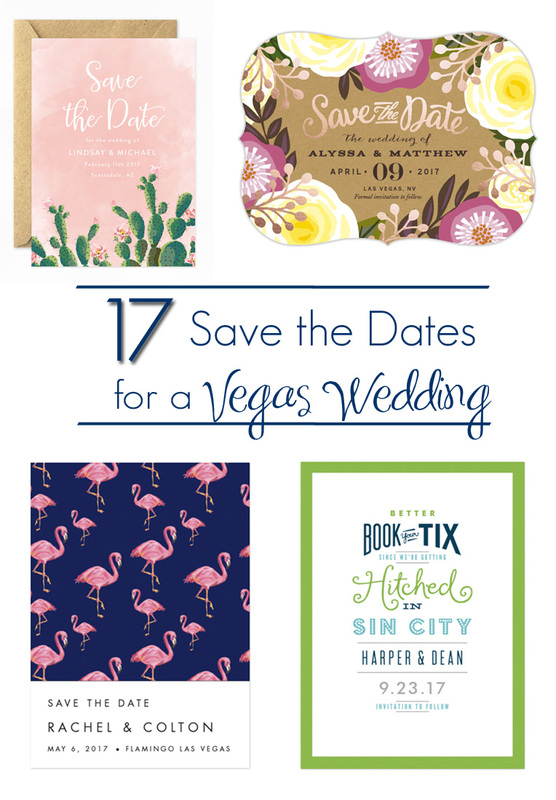 It has so many great options and ideas and photography, especially if you’re like myself and want to have a wedding that isn’t so “touristy” and cliche for a Las Vegas wedding. My fiance and I are locals and we really don’t want to do the Elvis officiant and photos in front of the welcome sign type thing. We’re looking at April sometime next year and will have a guestlist of fewer than 100 people with a budget of about $2600. 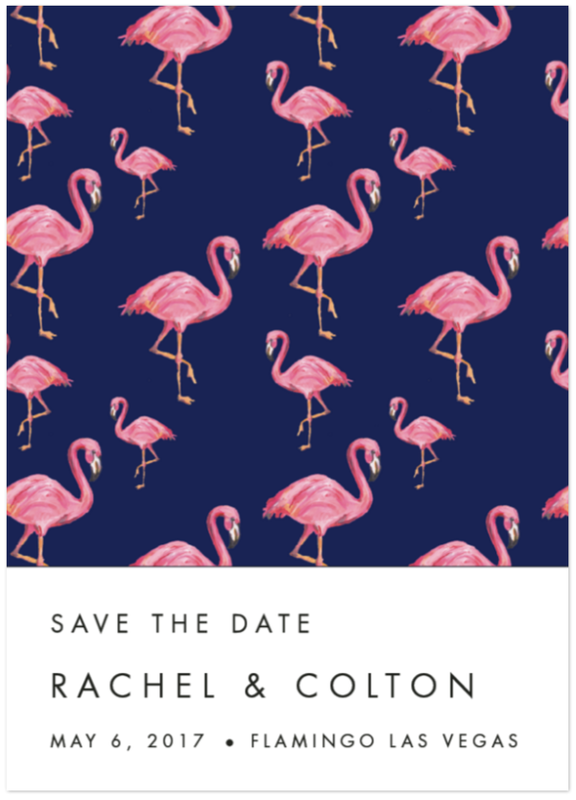 Luckily my fiance’s family graciously offered to foot the bill for the reception as a family friend can cook up a storm and we will be supplying the bartender and liquor. We’re totally fine with this idea, however, it seems like all the nice venues require licensed caterers and bartenders with their own liquor liability insurance OR we have to go with their caterers and no outside catering is allowed (which tends to be way more expensive). Have we run out of options? Is the only option we have a complete DIY wedding at the park? We love Historic 5th Street (from what I’ve seen on your blog and the research I’ve done) but again, we need licensed caterers for the food and the bartending services must carry a liquor liability insurance that is also a caterer through the city (unlike our personal friend who is indeed licensed and has a health permit who works at bar, but she doesn’t freelance so she doesn’t have that insurance). Thanks for any input you may have for us. I’m running into so many dead ends. Appreciate your time, and keep up all the awesomeness! Well this one is a dilly. To be fair, these venues use insurance and health permits for your protection, so they will be hard to sidestep. Event insurance is really important for your safety, the guest’s safety and the safety of anyone working at the wedding, even if they are family friends. My recommendation is for a venue change. Although it’s become increasingly challenging to find private homes that host events due to permit changes, there is one venue that immediately comes to mind: 2810 Estate. I’ve consistently seen events continue to be held here, and this would be a way to host that number of people with the catering and liquor selection you would like. Another way to do this would be to get creative with the catering (e.g., see this 2011 post about self-catering a wedding on Offbeat Bride). You might also have luck with venues like The Grove and A Secret Garden, who may allow you to bring in your own caterer. You still might have to deal with the licensing/insurance, issue though. Perhaps someone will pipe up with another suggestion in the comments, however. 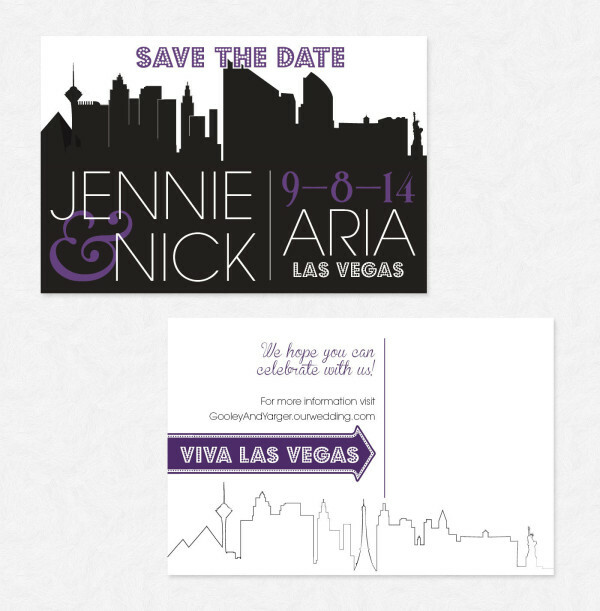 Time for another LVW Monday Mailbag where you get to hear my thoughts and opinions on Vegas wedding planning questions. First of all, let me just say that your website is absolutely stunning! You have such a well-organized and adorable collection of information! I am hoping to get your input. 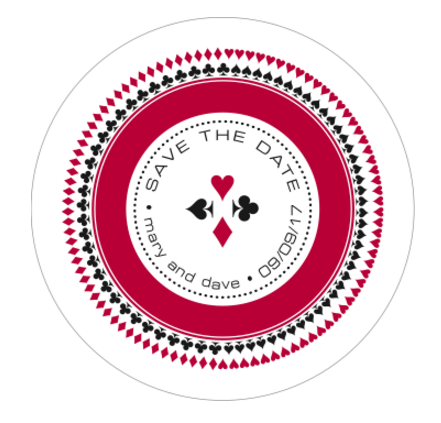 I’m getting married near the end of March and my fiance and I are looking to get married in a romantic, non-cheesy venue just the two of us. We prefer to have it “feel” intimate and secluded (not as if there should be 50-200 chairs that are missing). Any venue from $500 (preferred) to $1,000 (considered) would be considered. Preferably tropical, but we would consider a garden setting (must feel organic and natural/outdoor). Thanks in advance for your time and consideration. We truly appreciate your response! My first thought is to hire a minister or officiant and have them meet you at the gardens at Springs Preserve or at Symphony Park at The Smith Center, so you don’t have to pay a venue fee. The Springs has a more desert-y feel, but the The Smith Center has palm trees so is more tropical and also has a nice green space, with lots of spots for great photos. They are both modern, unique and non-cheesy but still intimate and romantic. As a bonus, neither has chairs that would stick out as noticeably empty. It would also be worth taking a spin through the intimate wedding venues in the directory to see if something catches your eye. 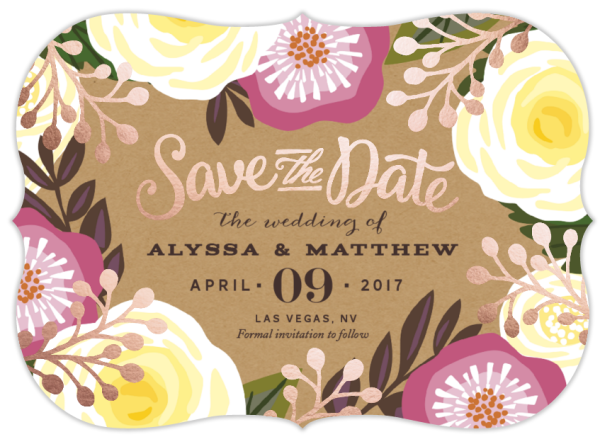 Have a Vegas wedding planning question? 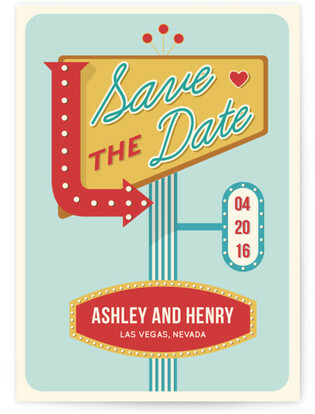 Feel free to send it to me at kelly AT littlevegaswedding DOT com with the subject line: “LVW Mailbag” or leave a comment on one of the posts. I may answer it in a future mailbag feature. Questions may be edited for length and privacy. If you want more immediate help, I encourage you to join the LVW Wedding Planning Facebook group. 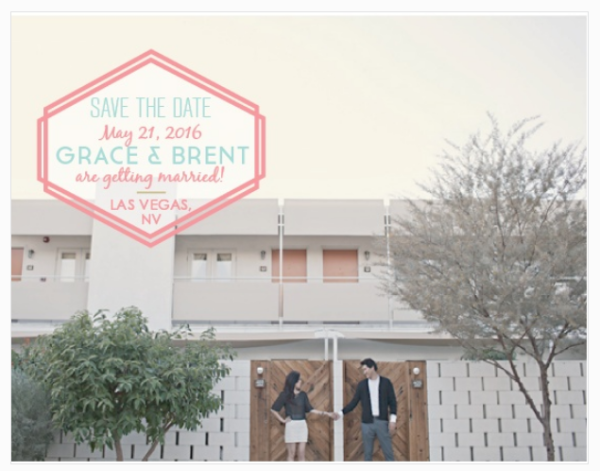 This private group is full of people planning their weddings just like you as well as some vendors. Both are great for knowledge and advice and are probably much more in the know than me! You can also read past mailbag questions here.